DESCRIPTION: Body predominantly yellow with dark region on upper back containing two white spots. White vertical bar behind eye. Bluish vertical line in front of eye. RANGE: North Pacific. Japan and Taiwan to French Polynesia and Hawaii. All of the fish pictures on elasmodiver.com are copyright protected. 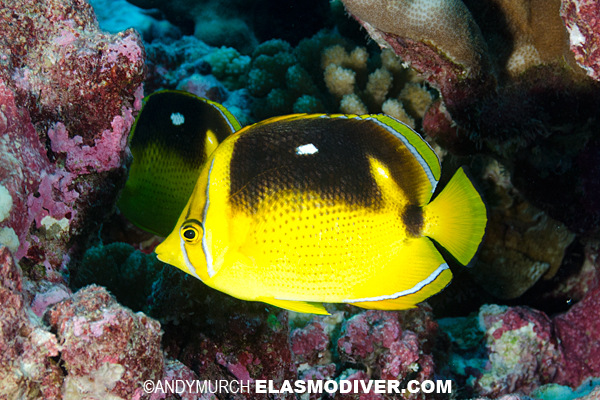 No unauthorized use of these Fourspot Butterflyfish pictures is permitted. Please contact Elasmodiver for further information.